The tradition of Irish dancing sparked the interest among the viewers since the introduction of Riverdance back in the 1990s. The Irish culture started to become associated with step-dancing, which is one of the directions, taken into account when we talk about public performances in Europe. Anna Meese decided to blend the classic components of the routine with the modern elements as she opened a school of Irish dancing. Anna was born in Pennsylvania, but she knows what it means to be obsessed with the Irish cultural tradition. She thinks that the scenes from the legendary film Footloose illustrate her dedication to dancing in the best way. 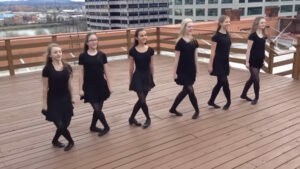 Her school is based on accepting the basic rules of the Irish step without turning it into a routine with the rigid restrictions. Anna says that the students of all ethnical backgrounds are invited to take part in the dancing campaign, and this may be another reason why the Footloose theme turned out to be so popular and gained the team a lot of fans on the media. Below, you will see the compilation of dancers who pull off the trickiest moves on camera. Anna is responsible for making them realize the importance of following the tradition without the copying other people’s style, and the arrangement that was made to please the crowd helps the tape gain positive comments on the social accounts. Anna Meese is an extraordinary personality who feels that dancing is her true calling. When she decided to introduce the routine to the fans, she never expected that the feedback would be instant. You will agree that step-dancing, presented below, is one of a kind. The performers are busting out the movements with an elegance that has to be mentioned once we start talking about the intricacies of modern art. Though the choice of the composition may take the audience back, the Irish theme remains a topic for discussion as people discover the attraction of the style. Check it out below and prepare to be impressed. You will be watching the clip again and again!